nce upon a time there was a young man called Billy Weaver. His job was not very interesting but he enjoyed it. He was a travelling salesman. At the start of this story he was only seventeen years old and had not been in his job for very long. He was keen to be successful at his job and to save enough money to buy himself a nice car. On this particular day, he was dressed in his suit (his only suit) and had just arrived in a small town on the south coast of England when our story begins. It was a really cold day and Billy was shivering .His first job when he got to the town of Seaport was to find himself a place to stay for the night. He had enough money to stay at a local hotel and he knew that there he would be able to chat to a few people, have a few laughs and maybe play a game of darts. However he was also quite keen to go to bed early so that he could make a good impression the next day. He spotted a man selling newspapers. Billy made his way along the street. There were no shops at all, just a row of houses that looked identical. They had porches and pillars and four or five steps going up to the front doors. It was clear that once they had been very smart houses, but now some of them needed a coat of paint and some of the windows needed fixing. Suddenly, in a window that was brightly lit, Billy caught sight of a sign. It was propped up near the top of a small window. 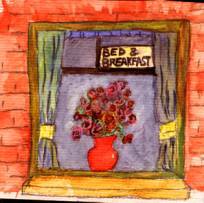 It said ‘BED AND BREAKFAST’ Just under the sign there was a vase of pretty flowers. It looked very cosy. He stopped walking. He moved a bit closer. Green curtains of some soft material were hanging down at each side of the window. The flowers looked lovely against them. He went right up to the window and pressed his face against the glass. He could see inside. The furniture was pleasant, there was a bright warm fire burning and just in front of it a small dog was sleeping. There was a large sofa, two big armchairs and in a corner next to the piano he could see a parrot on a perch. It looked like a very nice house to stay in, but maybe it would be very expensive. He thought he’d move on to the hotel he’d heard about. He couldn’t decide what to do. In the meantime he was getting colder and colder. He decided to walk on and look at the Hotel. If it looked too noisy he would come back later. He turned to go. Now a strange thing happened to him. He was on the point of stepping back and turning away when all at once his eye was caught again by the sign in the window. It said ‘BED AND BREAFAST’, but he words seemed to be pulling him towards them in a very strange way. They were like a large black eye staring at him and forcing him to stay where he was. Before he knew what was happening he found himself climbing up the steps and pressing the doorbell. He heard the echo of the bell ringing in a room far away at the back of the house. Yet even before he had taken his finger off he button the door opened. Normally when you ring a bell you have at least half a minute to wait before the door opens, but this woman appeared so quickly that it made him jump! She was about 45 or 50 years old and as soon as she saw him, she gave him a warm welcoming smile. It was fantastically cheap. It was almost nothing. He could hardly believe his ears. She looked so nice, exactly like the mother of your best friend at school. The one who made the lovely biscuits and didn’t mind if you made a mess on the kitchen floor. Billy went inside. He took off his hat and his coat. “Let me help you” she said. There were no other hats or coats in the hallway. There were no umbrellas, no walking sticks in fact no sign of anyone else at all. Billy told himself that the old lady was slightly mad. But at ten dirhams a night he couldn’t see anything wrong. “I’m sure you must have a lot of people who want to stay here’ he said politely. “But everything is always ready, just in case the right young man comes along. It is such a pleasure when I open the door and see someone who is exactly right” She was half way up the stairs in front of Billy. She paused and turned, half turning her head to see him better “Just like you” she added and her blue eyes travelled right along his body from his head to his toes and back again. He put his suitcase on a chair so that he could get his clothes out. As she went downstairs Billy thought to himself that she was probably a little dotty, but harmless enough and he was grateful for the cheapness of the room. Maybe she just liked the company? Maybe she had lost a son in the war? Maybe the son had looked like him? Who knew? Did it really matter? “Such charming boys” said a voice behind him. He turned and saw his landlady, holding a large silver tray in her hands. “You don’t need to do all this for me” said Billy, still deep in thought. He stood by the piano, watching her tiny hands moving backwards and forwards around the teacups and the biscuits. The hands were small and white, but the nails were deep red. It is so annoying when you can half remember something, but can’t put the finishing touches to it. He could feel her eyes resting on him and she patted the empty place next to her on the sofa in a way he couldn’t refuse. He picked dup the teacup and began to sip his tea. “I suppose it is a long time since he left” said Billy, trying to think of something sensible to say. Billy stared at his landlady; he put down his cup and moved to one side of the sofa. She leant across and patted his knee. There was a pause, by now Billy was beginning to feel very uncomfortable. He picked up his cup and took another sip of tea. He waited for he to say something else, but she seemed to want to be silent. He waited for her to speak. There was silence. “Of course” she said. “And have you met my little Basil as well?” She nodded towards the small dog curled up by the fire. Billy looked at it and suddenly realized it wasn’t sleeping at all. He put out a hand and touched the top of its back. The back was as hard as iron. What looked like fur was as stiff as a brush. When he pushed the hair to one side he could see the skin, grey and dry and perfectly preserved. “No thank you” said Billy. He didn’t care too much for the taste of the tea. It was bitter, rather like the taste of almonds. A choosy person has very high standards and is careful when they choose something. The way you feel when you don’t understand what is happening. A rubber bottle full of hot water that English people put in their beds so they don’t get cold feet! Light meal some people eat before they go to bed. Book kept in some hotels and private houses for visitors to sign. Something that makes you a bit angry. What the dentist puts in your teeth to fill up a cavity (hole). A way of preserving animals so that they still look real.